Ideas, maxims, thoughts, and questions on editing. NEW PROJECT, NEW STORYBOARD! And too much fun with sticky notes. At DOC NYC 2018, I had the pleasure of moderating a discussion on “Storytelling in a Post-Truth World” with editors Rabab Haj Yahya, Bryan Chang, and Rob Kuhns for the festival’s “DOC NYC PRO: Mastering Your Craft” series. While the subject is particularly charged in a world of “alternative facts” we all agreed that it is an issue that is always at the heart of documentary editing and present at every stage of the edit. We discussed a range of ideas, including reviewing raw footage, believing our subjects, the ethics of Frankenbites, fact-checking, and how different contexts allows for more or less editorializing to name a few. We also got into something that I am personally always fascinated by: if documentary should or shouldn’t provide a strong perspective, and if “both sides” always need a voice in a film. Afghan Cycles premiered earlier this year at Hot Docs, and since then it’s been a lot of fun getting to be there for some of its festival tour. I love being there for post-screening conversations, which for good reason often center around where the women in the film are now, Afghan politics and culture, and what it was like for the director filming and building relationships with the film’s subjects. I’m always happy, though, when some questions turn to the storytelling and editing process, and it’s been interesting to discuss a range of topics, including: determining the protagonist for a film mid-edit (and how that can restructure an edit); editing in a language one does not speak; the tough decision to cut certain characters; balancing multiple stories; using the backdrop of a changing Kabul as a main arc in moving the story forward; and more. Each one of those is something worth diving into, but there was another topic which really stuck with me. I came up multiple times, and would start more as a simple comment about the powerful and chilling inclusion of a controversial voice in the film: a powerful man denouncing women riding bicycles and even promoting violence against them for doing so. It was the type of footage that instantly shook me, and at first there was no question from the director nor myself that it was too powerful to ignore. After all, it shows the very real threats these women are up against. However, in the editing room, I began to feel uncomfortable giving this man a platform for hate speech and promoting violence. Why did we have room for amplifying his voice when we were leaving some of our brave cycling characters or their supporters on the cutting room floor? To understand the truth of the cyclists’ bravery, we had to understand the threats they experience, so we decided to keep this man in the edit. However, we chose to include him only once and to isolate him to his own scene at a pivotal moment in the declining security levels. In doing so, the idea was to let it be known that these threats are a very real presence, but we don’t hold it his voice in the same regard as other characters’ voices. We worked to make his interview feel like its own scene - even witnessing the beginning of his arrival to the interview – to further imply that this is one person’s view and to not allow his voice to convey the objectiveness of other formal sit down interviews. I believe it was the right call and that it remains one of the most memorable parts of the film. And beyond the specifics of this film, it was a good lesson in how the honesty and integrity of a film comes not just from the content included in it, but the context in said content is included. Emotion on and off the screen. Part 2 - remaining critical. Going off the last post, I will also say that find value in becoming slightly jaded to the footage. I always note my initial reaction to the most powerful footage and remember the audience will likely also have a strong initial reaction, but it's also important to remain rigorous about making the scene work so that it is serving the piece as a whole and not just in there for the sake of it being highly emotional. With a slightly jaded perception, I find that I have to try that much harder to be impressed again with the way the footage plays into the whole film. It can be a little manic of a process, but being able to see the footage through a lens of radical acceptance and then flip to a lens of harsh criticism, has allowed me in the past to see a more nuanced view of any given clip's limitations – and its potential. Emotion on and off the screen. Part 1 - remaining available. Editing can quickly become a very intellectual practice, and even emotional scenes have a way of becoming deconstructed into their mechanical parts. After multiple views, it can be hard to access the same emotional response as the first time one saw it. So, I've found it useful to develop ways to remain in touch with my own emotional experience, to remain fully moved by the emotional content in the edit. One way I personally do that is through music. I like to create playlists of music that match the emotional tone of the piece I'm editing. Then I'll listen to those songs outside of the working environment – on a walk, while cooking, etc. It's not really a soundtrack to the film, but more like a soundtrack to the editing room where the film is being cut. I find I can access that emotional place the viewer will/should be in, which helps me communicate better to them. Editor Pedro Kos recently touched on something in a speech he gave at Sundance which spoke to me, as well. I’m always amazed how watching the same edit – a digitally replicated, identical output – can feel different depending on the circumstances under which it is watched. Watching with an audience and feeling the emotions in the room is one of the more powerful versions of that phenomenon. But it can also take shape alone in the editing room. I almost always watch edits within the editing software. It's the standard way to do it, and on top of that it's where all the clips that make up a timeline are mutable, and there's plenty of opportunity for swift improvements. However there are also times, such as where I’m at now in my current feature length project, where I need to zoom out and watch down the entire film to get a sense of it as a whole without being distracted by making changes as I go. I was intrigued to realize that if I export first – create a file that I don’t have the ability to change – watching down the film feels very different. My perception of the film feels much closer to watching as an audience member, feeling the flow of the edit, and watching the film for what it is. In some ways I accept the edit more watching this way, but in other ways it allows me to be a harsher critic in that anything not working stands out and reminds me that I can't keep saying "it's just a rough cut" forever. There is a documented phenomenon that when an athlete observes their sport being played, the neural areas of their own brain which control said action are activated. For example, when an amateur basketball player watches a shot being taken on TV, the part of their brain that actually controls moving the body to take the shot is active, even though they are sitting in a chair. In other primates (and likely humans) these are called mirror neurons, and they are theorized to account for a range of of learning and empathy functions. This phenomenon may be incredibly important to how editing works, why film is so powerful to people, and the ways in which viewers engage with what's on screen. 3 Acts or 7 Acts? I often think about editing in three acts, but recently I've been looking at my current project as being in seven acts, and I've found it fits that structure fairly well. Ideally I hope any story would have a natural structure of its own, but I think it's also a nice "structural integrity" test to see how an edit fits multiple models. It's a very satisfying time when one arrives at a proper rough cut. Even after reviewing footage and then crafting a storyboard like the one below, there's still plenty of mystery about how the story will really take shape. While much less romantic than the colorful image above, below represents a huge step – a watchable rough cut! Editing this first cut is really a unique phase – almost more like writing. And now the story gets to be rewritten again in a new phase of editing. But first, time for one of my favorite tasks...redoing the storyboard to match the new cut! The idea of “setting the clock” to give the audience a sense of where they are in the film. And finally “Listen to people’s problems, never their solutions.” I find feedback sessions and rough cut screening to be an incredibly important part of the process, and discovering how to read between the lines is a fascinating and sometimes daunting exercise. This might be the best advice I've ever heard on the subject, and definitely the most elegant. Once I was speaking with an abstract expressionist painter, and she recalled a lesson from her teacher, George McNeil, describing the balance of color in painting. McNeil said one wants those fully saturated primary colors on the canvas, but you also need the "real color": shades of brown, grays, and muted tones. In editing, I try to remember this pallet concept (in a metaphorical way, no longer really about color). Maybe some scenes are experienced as "real color" and some might be experienced as the more ecstatic "fully saturated primary colors". I feel that something special does happen when a piece as a whole can allow for some communication between a grounded "reality" and a more expressive, colorful one. Maybe the two elevate each other, or maybe this contrast speaks to the relationship our senses, thoughts, and memories already have with the reality they try to make sense of. "When I walk into this room and get a stomach ache, you’ve got to walk into this room and get a stomach ache. Right? That’s the way it’s going to change." Finishing a film is no small task, and world premieres for one's projects don't happen every day, so I was thrilled and honored when I heard Charged would be the opening night film at the 2017 Santa Barbara International Film Festival. The whole team came together to celebrate the moment that the film entered the world. Not only did the festival roll out the red carpet, but the community around the festival are real cinema lovers who come out to watch films, support the festival, and engage with filmmakers. It was all a blast, and one of the many memorable things for me was our two Q&As. I was surprised how present editing questions were in our discussions, and thanks to the inquisitive folks in the audience, we were able to discuss things like the process of getting to a rough cut, the process of refining that picture lock, the group effort involved throughout, the director-editor relationship, the subject-editor relationship, handling sensitive footage, the difficult decisions to kill darling scenes, and one of my favorite questions to ponder: how much is the story known before editing, and how much does the footage itself influence what story will be told? Editing has its stressful times, so it's wonderful to take moments to reflect back on the months of editing and remind oneself that (as my favorite Oblique Strategies card says) "once the search is in progress, something will be found." How to effectively introduce a character in a film is something that has fascinated me ever since I first saw the reactions to an early rough cut screening of my first documentary feature, A Will for the Woods. I love the films I’ve seen edited by David Teague and was happy to hear his thoughts on the subject via this No Film School write up from a talk at Camden International Film Festival / the Points North Institute. I appreciated all the points listed in the article, but the one that really resonated was the advice to "introduce your character, then introduce the complexities." It brought me back to that early rough cut screening, where my fellow filmmakers and I found something similar to be true. In our first cut of that film, we were introducing Clark in an everyday scene – hanging out in the kitchen with his partner, Jane, while she prepared a salad for him. The conflict of his terminal illness and the concept of "green burial" were not yet revealed, but details about his life were: he plays the piano, Jane seems to take care of him, they put vegan bacon on their salads, etc. I anticipated it to be seen as a sweet introduction; however, we kept hearing from our rough cut audience that they just weren't connecting, as if to ask "Why am I watching a film about this person?" Yet, they didn’t specify that the first scene felt that way. Rather, it was expressed as an overall impression. When we switched the opening scene to one that addressed the central issue of the film – Clark planning his own green burial – audience's instantly found him sympathetic, strong, and engaging. Later on in the film, in that same kitchen scene where he just watches as Jane does all the work preparing his food, audiences were more sympathetic to the nuance of the relationship and the characters. It was fascinating to see how the first impression had a ripple effect through the rest of the scenes. It's always fun to get the chance to talk about doc editing and to share a bit of that process with the film's audience. Watch the quick behind-the-scenes video of storyboarding Charged. Working with director, Phillip Baribeau. The madness is only beginning. 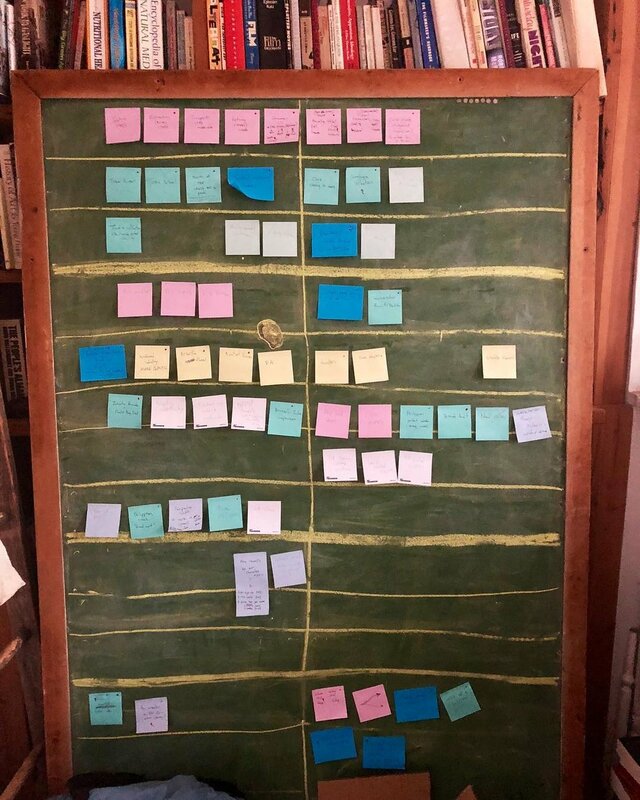 I'm editing a feature documentary right now, which is a long process full of moments of beauty and epiphany coupled with moments of wondering if this "process" and endeavor is completely bonkers. I've just completed the first phase of editing - watching the footage. All (or almost all) 300 hours of it. It feels necessary to me (at least for projects like this one) to know the footage intimately. I've done it before, but this is the most footage I've watched down in this intensive of a time, and it had me wondering about the "process". I've been taking notes, actively formulating ideas, but at the end of weeks of watching there isn't much to literally show in terms of an edit. I've just watched...and listened. Watching and listening have such different connotations in English. Obviously they relate to different senses - the two physical sensations communicated with a film. But to say "I watched someone" versus "I listened to someone" feels very different. Why don't I say that I listened to 300 hours of footage instead of watching 300 hours of footage? I've always been confident that this stage of editing is incredibly valuable, but at the same time have been awkwardly apologetic for it. Then I recently read an article about words in other languages that do not exist in English. I love lists like this. One word in particular jumped out to me: dadirri, Australian Aboriginal, “a deep, spiritual act of reflective and respectful listening”. Now I'm not trying to claim I understand the cultural subtleties of what this may mean, or appropriate the word, BUT I am grateful for words like this because – like magic – just naming something can create mental space for that concept to exist comfortably in one's mind. Almost immediately I felt more at ease with this "deep reflective listening" process because a whole civilization of people where insightful enough to have a word for it. It's not a bonkers process; it's profoundly respectful. If the footage is going to tell the story, I as editor first need to listen to what that footage is trying to tell. These words from the editor of the BBC’s Storyville really spoke to me in relation to the new doc I'm editing. As I watch through the footage and germs of story and structure are planted in my mind, I have to ask myself many of the questions proposed here. "The best docs celebrate a sense of the accidental. And they matter. Like unknowable bits of the universe, they come into existence when a collision occurs. The collision needn’t be violent, and it can indeed be contrived. Nonetheless it has to happen, and something has to occur when it has happened. Good docs appear to wrest a degree of coherence from the contingent mess of life, but when we finally leave them we must be aware that the ordering was wholly provisional. That’s the only real way to make a documentary film – by setting out what you believe to be true, or beautiful, and destroying any certainty by implying that, yes, it could have been described in a near-myriad other ways. This comes down, I think, to having a strategy for life while being prepared to abandon it. What other way is there of staying alive? I know this may sound like warmed-over existentialism, but this is the conclusion I’ve come to after sitting watching doc after doc, in an effort to write a non-academic, fan’s-notes book about the form. The docs I like are irremediably hybrid – a mixture of authorial personality, cod epistemology, appropriated or created history and whatever seems current and interesting. Sometimes they are polemical, sometimes tinged with fictional contrivance. The only rule is that they should have no rules. They should be, rather than tell. They should make the worst things comprehensible. No documentary should be without some aesthetic bliss, even if it is tamped down, minimal, barely noticeable. So yes, documentaries do matter, I think they really do." Being well-organized is a virtue listed in almost every job posting seeking an editor, and with good reason – it's incredibly important. But beyond the need for basic file organization, the process of using bins within a project can sometimes move past a technical, administrative task to a useful creative tool. I recently started editing a project that has to unpack a message with many parts to it, through many voices. Unlike a film that has distinct scenes, organizing here could go a few ways: by person, theme, etc, but in the end those weren't getting me any closer to putting together a cohesive argument, story or film. It reminded me of a talk I heard from Alan Berliner on editing. He said he names bins based on emotions, or abstract terms that will trigger emotions (I'm paraphrasing here) – basically words to conjure what experience and feeling one gets from the specific footage and wants to reinforce in the edit. And what's left is building blocks of a different fabric than just their literal content. Maybe diverging from such strictly intellectual categorization of clips can give more insight into what the building blocks of any given film should be. 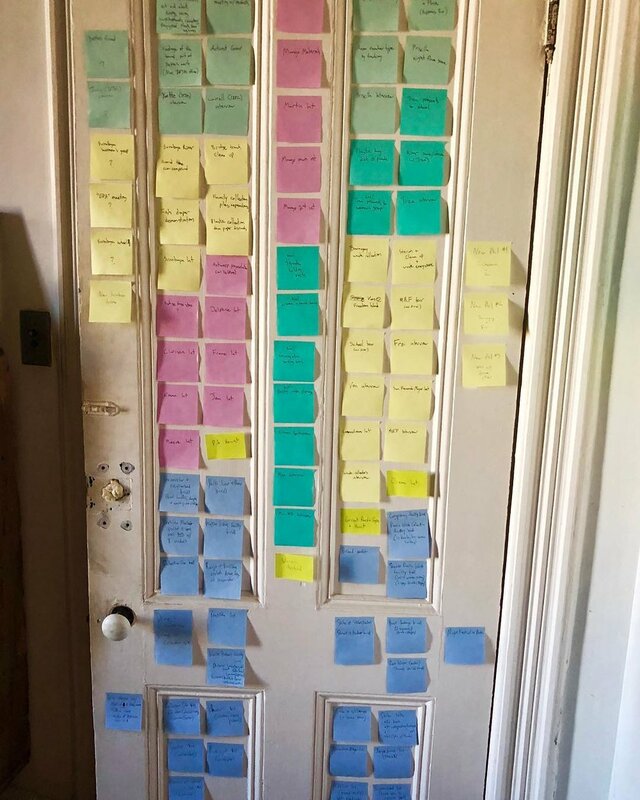 Certainly the uniqueness of any project will call for a unique process – and I've come to find that when embarking on a new edit, it's exciting and fascinating to explore the question: "what are the building blocks for this edit going to be".